I’m convinced that blight has settled into the Suburban Farm. Each of my cherry tomato plants is brimming with beautiful green fruits, yet nothing is developing. With plenty of sunshine and rain, these fruits have sat for weeks without turning. Except for one. 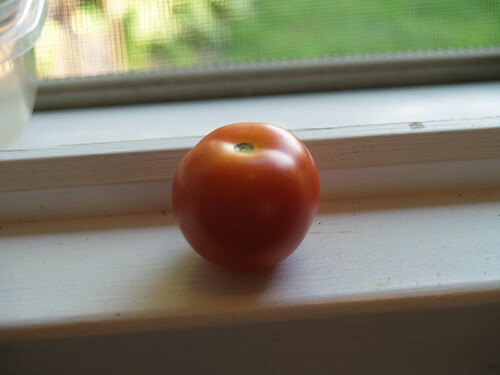 My one, lonely tomato. I feel sad, because I though I could escape the blight. Instead I see spotted leaves, drooping stalks, and a lot of wasted potential. I should pull out all the stalks, but this one tomato has given me hope that maybe all is not lost. I’ll give it until the weekend. Anyway, the cucumbers need room to spread their wings. Hi Caroline! A couple of weeks ago I also thought that my plants got sick. We were about to leave for a trip, I didn’t have much time. I made a magnesium solution and sprayed all tomato plants. Upon our return, I found the plants in good shape. My last post has pictures. Epson salt is a sourse of magnesium. A lot of info can be found on the Internet. Good luck with your plants. @Tatyana: thanks for the tip! I’ll try it tonight (if it doesn’t rain). Well, my tomatoes have finally started turning red. How about yours? Yes, we have red tomatoes! I’m so glad I waited.